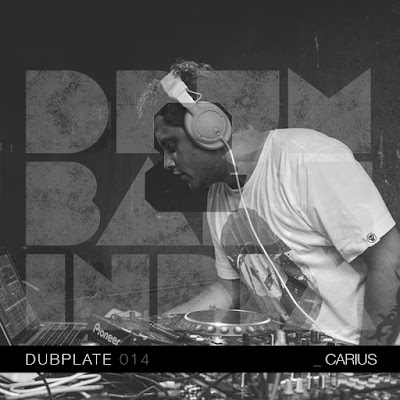 Carius from Pune, who has been pushing Drum & Bass in the country, for the last many years, is the featured artist for our 14th Dubplate for #BassMondays. He was voted as the runner up in the Best Drum & Bass/Dubstep DJ category at the MyFav DJ Awards consecutively in 2014, 2015, and 2016. The man behind Pune’s bass heavy night called Poona Bass Kulture at blueFROG Pune, he featured acts like Shiva Soundsystem, Bay Beat Colllective, OX7GEN, Bandish Projekt, Yung Raj, EZ Riser, and Tapan Raj along with his home crew of TripShot Crew, Midland Sparks, and FolkStep. He currently works with Mixtape, an artist and event management company based in Mumbai. From his future plans to his thoughts on the evolution of Drum and Bass in the country, and from his current favorite tracks to his best gig ever, here is the conversation we had with Sainath Bhagwat. A : The story behind the name is quite feeble. I had started mixing Drum & Bass and a friend asked if I’d play a gig he was putting together, and I had to come up with a moniker for myself. As lame as it sounds, I googled Greek god names and Carius is a Greek god who has learned music from the nymphomaniacs and at the time I was really into Nymfo’s music so it kind of fell together. DnB and Footwork is something that naturally moves me, physically and emotionally, so it really makes sense for me to play something that I really love so much. A: It was in 2011 in New Delhi. I went for a Nu:Tone party and that was the first time I heard Drum & Bass. A: I feel that the growth graph of the bass scene is quite skewed. There was a boom around 2008 to 2012 when there were acts like Bass Foundation, Bay Beat Collective, the Wobble crew with Bandish Projekt, Pravvy Prav, Uri and FUNC, Mental Martians (don’t forget Deaf Bass Twins), and Vachan doing his Wednesday nights in Bangalore. I feel it kind of died out a little around 2012 to 2013 but in the last two years there have been so many new artists popping up, it feels like there is a nice chance for bass music to hit the mainstream in the country. Nucleya has already taken the first big step in this direction and now its only a matter of time when people start noticing the more underground sounds of the music. Also, back in 2010, the scene was quite concentrated to limited promoters and small pockets in New Delhi, Bangalore, and Mumbai, but now it feels like it’s opened up which is excellent. The scene is definitely no where close to its peak so there is a huge potential for it to grow. 4. Tell us a little about Poona Bass Kulture. The ideology, method and aims that were behind the project. A: The idea behind Poona Bass Kulture popped up when I was asked to curate and be a resident for a bass night at blueFROG Pune. I thought it made sense to mix up the lineups with local acts as well as domestic acts touring the country in order to showcase bass music in the best possible manner. We were able to bring in some of the best domestic talent and have Pune acts play alongside. I think we did 10 odd nights but we were able to bring in everyone from Bandish Projekt, Shiva Soundsystem (Nerm), and Bay Beat Collective to Johnny B, Folkstep, and OX7GEN. 5. You’ve recently started to work with Mixtape, how’s the experience so far? A: It’s quite overwhelming to be honest. Having said that, we are a closely knit team, and there’s a lot of nice work that we get to do. From artist management to doing our own nights to handling stages and ground production for music festivals, the job definitely has a 360 degree take on the industry. 6. Is music production in the future to-do list? It definitely is. I have been making music but the last one year I consciously took a break since I wanted to settle in the new job and the city properly. I think I have a fair grip of things now, and after I’m back from a holiday which I’m taking this month, I’m getting back to producing. I’m in no hurry to put anything out though. As you say that the country is still coming to terms with this genre, the biggest con is that there are a lot of times when the audience at the gig has never heard the music. Some of them are shocked by it, and some of them kinda start loving it. I was playing a gig once and there was a biker gang at the club and I was like, “oh they are gonna want some Rock N Roll”. It’s funny because the whole lot loved bass music so much that they were raging all night. The thing with Bass music is that it is extremely dynamic and local flavours can really define the sound. Us as artists have an opportunity to create a unique sound that is not only local to India, but even more to individual cities where we are from. A : I mix using Traktor with an X1 controller and I recently got rid of the my Audio 10 interface and just plug in straight to the mixer. In a few more months, I want to drop the X1 controller and start using CDJs. Lesser equipment to carry for gigs, you know. A : It definitely has to be the night we launched Bomber Man. The whole concept of Bomber Man was quite accidental. Me, Tripshot Crew, and MC Soopy were supposed to play Poona Bass Kulture and two days before the gig Ved came up with the idea of moving the console onto the dance floor to make the vibe more intimate. The L’Acoustic system at blueFROG Pune has never sounded sweeter than it did that night and that’s partly due to the fact that we were in front of the PA, but the way the night went off, I haven’t seen any other night in Pune that was a total rager for three hours. People were dancing on the stage, and a whole lot was moshing. A: We were playing in New Delhi and I was closing the night when me, Midland Sparks, and Sharkom posed for a picture towards the end of the set. Gun fingers were going all around the DJ booth and a bottle of beer fell on my laptop. Tracks started skipping and I really had no control. Luckily Maitreya was still setup, so he took over the last 10 minutes or so. A: I’d dread the fact that it will knowingly be my last gig ever but I’d like to end it all by playing Seba’s Identity.